Backflow Prevention in the residential situation… is it really necessary? Peter McLennan suggests it is. Having been involved in backflow prevention in Australia for over 25 years, I have seen numerous occurrences of cross connections that, if exposed to a backflow event, could well have contaminated the public water supply. Luckily very few backflow events have eventuated (or been recognised) so generally the water we drink is delivered as the water supplier intended. Very little explanation is needed for the general public to accept and agree that backflow prevention is required in the industrial environment. They can even understand about the commercial environment being able to contaminate the water supply, but begin talking about residential connections and it becomes a topic where the community can be much divided. When you understand that the function of a backflow preventer is to protect others from an illegal cross connection within a user’s piping system, it is then obvious why most councils and Water Authorities Australia-wide make use of residential water meters that have an approved backflow preventer built into the meter body. This prevents the water in the supply main in the street from becoming contaminated by a cross connection that may exist after the water meter. In essence they are protecting their asset, the water that has been treated and delivered to your meter. This protection then ensures that the water you get has not been contaminated by your neighbour. So, what can be hazardous to the water supply in the residential environment? Let’s examine this. Think about what you do with your garden hose. It gets left in the pool or spa to fill slowly overnight. It gets attached to a pressure water cleaner, which often has a function where detergents and cleaners can be added to the water as it is spraying. It gets poked down blocked drains and left in car radiators to flush them. Lastly, one of the most dangerous is the common garden fertiliser injector spray system. It is designed to mix the water with all types of chemicals used for killing bugs and fertilising your plants. Would you drink the water from a hose used for any of these applications? Equipment used that directly connects to your water supply. For example, Amateur photographic equipment, DIY irrigation systems, Hydroponic growing systems, illegal alcohol stills and drug lab equipment. One item that seems to be growing in use is the DIY home bidet and body washing equipment. When not protected, anything used in these items can potentially get into your water and end up in your morning coffee. Residential rain water tanks. What! I hear you say? We in Australia have been drinking water from rainwater tanks since Botany Bay was settled. Why are they considered hazardous when connected to the mains supply through an automatic top up device? Well, as we live in a modern world, our rain catchment areas such as our roof are subject to accumulating contaminants from the surrounding environment. Last year a paper was undertaken and funded as part of the Queensland Urban Water Security Research Alliance and covers the water quality in water tanks connected to household tap water. For the full paper, please see the Australian Water Association Journal, February 2013 pages 88-92. It is one thing identifying the hazards, but how do we protect our water from these cross connections? 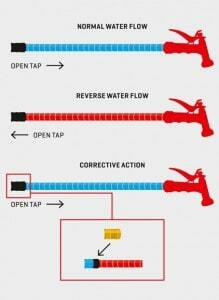 An inexpensive backflow prevention program comprising of hose tap protection, a backflow preventer at the rainwater tank connection and the water mains protection as part of the water meter will protect us from potentially harmful cross connections found in the residential environment at all levels. People will of course complain of the cost associated with this protection, but for a minimal outlay, you know your family are protected. In our houses, we have to have electrical safety switches to prevent electric shock and smoke detectors to protect us from fire hazards, why shouldn’t we also have water protection? Peter McLennan has been involved with Backflow Prevention in Australia since the late 1980s. He is the President of the Backflow Prevention Association of Australia Inc., and Secretary of the Backflow Prevention Association of Australia Inc. Queensland Chapter. 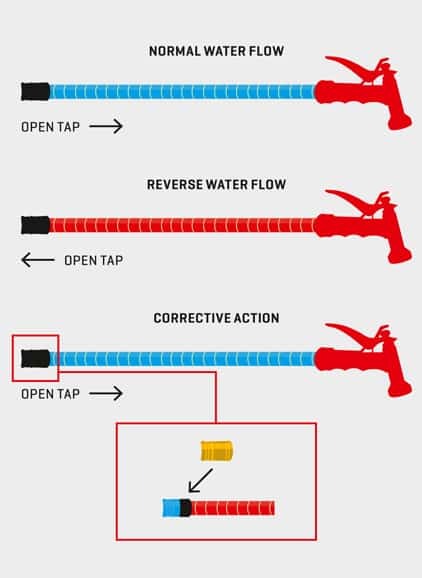 Visit www.bpaa.org.au to find out more about how the Backflow Prevention Association of Australia Inc. can help you understand Cross Connection Control and Backflow Prevention. Backflow Prevention Association of Australia Inc. Unnecessary cost or type of insurance?